The derivation of the name Mauchline is purely Celtic, made up of "Magh" signifying a field or meadow and "Linn/Linne" meaning a pool or lake. Therefore Mauchline, meaning "plain with a pool", would correspond with the original local description of the area. As the fields around the village of Mauchline abound with numerous springs, there must have at one time been marshes. The history of the village of Mauchline dates back to the 12th Century when the lands of Mauchline, together with the rights of pasturage, were granted to the monks of Melrose. They established a colony of their own order at Mauchline, which continued until the Reformation in the 16th Century. The monks established a church at Mauchline, which continued after 1165 and a community gradually grew up around it. The lands of Mauchline were then gifted by the Crown, to Hugh, Lord Loundoun by Act of 1606. In 1648 the Battle of Mauchline Muir was fought between the King's troops and the Covenanters. The date of date of the earliest entry in the Mauchline Parochial Register is 17th January 1670. Henry IV was born at Bolingbroke in 1367 to John of gaunt and Blanche of Lancaster. He married Mary Bohum in 1380, who bore him seven children before her death in 1394. In 1402 Henry remarried, taking as his bride Joan of Navarre. Henry had an on-again, off-again relationship with his cousin, Richard II. 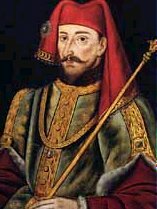 He was one of the Lords Appellant who, in 1388, persecuted many of ichard's advisor-favorites, but his excellence as a soldier gained the king's favour-Henry was created Duke of Hereford in 1397. In 1398, however, the increasingly suspicious Richard banished him for ten years. John of Gaunt's death in 1399 prompted Richard to confiscate the vast Lancastrian estates; Henry invaded England while Richard was on campaign in Ireland, usurping the throne from the king. The very nature of Henry's usurpation dictated the circumstances of his reign - incessant rebellion became the order of the day. Richard's supporters immediately revolted upon his deposition in 1400; in Wales, Owen Glendower led a national uprising in 1400 that lasted until 1408; the Scots waged continual warfare throughout the reign; the powerful families of Percy and Mortimer (the latter possessing a stronger claim to the throne than Henry) revolted from 1403 to 1408; and Richard Scrope, Archbishop of York, proclaimed his opposition to the Lancastrian claim in 1405. Two political blunders in the latter years of his reign diminished Henry's support. His marriage to Joan of Navarre (of whom it was rumored practiced necromancy) was highly unpopular - she was, in fact, convicted of witchcraft in 1419. Scrope and Thomas Mawbary were executed in 1405 after conspiring against Henry; the Archbishop's execution alarmed the English people, adding to his unpopularity. He developed a nasty skin disorder and epilepsy, persuading many that God was punishing the king for executing an archbishop. Crushing the myriad of rebellions was costly, which involved calling Parliament to fund such activities. The House of Commons used the opportunity to expand its powers in 1401, securing recognition of freedom of debate and freedom from arrest for dissenting opinions. Lollardy, the Protestant movement founded by John Wycliffe during the reign of Edward III, gained momentum and frightened both secular and clerical landowners, inspiring the first anti-heresy statute, De Heritico Comburendo, to become law in 1401. Henry, ailing from leprosy and epilepsy, watched as Prince Henry controlled the government for the last two years of his reign. In 1413, Henry died in the Jerusalem Chamber of Westminster Abbey. Rafael Holished explained his unpopularity in Chronicles of England:"…by punishing such as moved with disdain to see him usurp the crown, did at sundry times rebel against him, he won himself more hatred, than in all his life time…had been possible for him to have weeded out and removed." Unlikely as it may seem (due to the amount of rebellion in his reign), Henry left his eldest son an undisputed succession. If you think you may be linked to the Mauchline or any of the other Family Groups please make contact with Gordon Nelson using the following e-mail address: . © Copyright Gordon Nelson 2008.